The Woeful Absent Blogger; or, Where Is Joe Anyway? Greetings from your humble narrator/blogger. And yes, I am keenly aware that I have been rather absent over the last few weeks, as I work to direct the stage play of Frank Capra's classic American Christmas story "It's A Wonderful Life" for the Morristown Theatre Guild which opens this Friday at the new Family Life Center at First Presbyterian Church. The time and energy the blogging world requires has all been taken over by the needs of the show, and this will likely be my last post until our opening weekend is done. I hope readers and visitors here will forgive my absence and if possible, attend one of the performances of the show which runs from Nov. 30th thru Dec. 16th. Why not indulge your Christmas passions now and make your reservations by calling 423-586-9260!! See George Bailey attempt suicide on Christmas Eve! See an angel (without wings) named Clarence work to rescue him! See Bedford Falls! And don't forget little Zuzu Bailey, who has a flower which needs a drink! In a few short days I will return to the more usual topics/outrages/wit/debates-political-and-cultural/and overall guide to the Web World here. 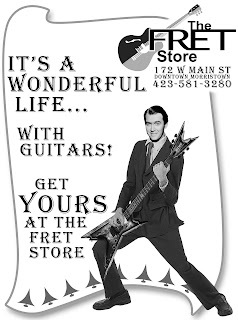 Before I close this post, there is an ad for the program for "It's A Wonderful Life" from a local music store which I thought you might enjoy as much as I did. Thanks for your consideration and readership. The creators of Conservapedia said their web site was launched to balance the 'liberal bias' of the web site WikiPedia. So what do conservatives read the most on their site? Want to know all the top buzz-words for 2007 in Japan? Of course you do. Tennessee Jed, aka Santa's Little Helper, has some pictures of the hanging the holiday decorations over downtown Knoxville.